Nutritional analysis is the process of calculating the nutritional content of food. The nutritional information calculated includes everything from calories to vitamins and minerals. What are the ‘Big 4’ and ‘Big 8’ nutrients? 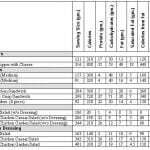 How is nutritional data calculated? Nutritional data can be calculated by one of two methods: laboratory testing or theoretical calculation. Lab testing involves sending a sample of the food to a lab where it is tested using special machines and scientific processes. Theoretical calculation involves using established databases of average amounts for each ingredient and compiling a profile for a recipe. More accurate as results are for the sample are verbatim. Data is based on averages for 100 samples. Some software can present the data graphically such and traffic lights for use on a food label. Takes longer to get results as they have to be sent off to a lab. Results can vary widely according to the sample. Results can be inaccurate if not done by an expert or someone not trained. Some ingredients are not always on databases. 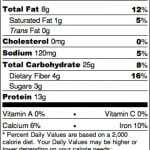 How accurate is nutritional information? For example, take a simple cheese sandwich. 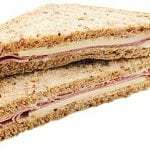 Is it made with white bread or wholemeal bread? Thick or thinly sliced? Did you use butter or margarine? Which brand? What about the cheese: was it mild or mature? What was the weight of cheese? If you added lettuce, what kind was it and how much? Maybe you decide to add a slice of ham. What brand was that? How has it been cooked? What was the weight of the slice? So you see….there is lots to take into account; every little factor can affect the accuracy of the nutritional data! Even if the food is lab tested, the results can vary from sample to sample. Which foods need nutritional information? Under current EUFIC 2014 food law, only food that is packaged for public sale is required to have basic nutrition information on the back of the pack (known as BoP). Front of pack (FoP) traffic lights are not a legal requirement but may be voluntarily added. If you do however, you must now use the standard EU format. The only other time you may need to include nutritional information, is if you make a specific claim about the nutritional content of the food such as: ‘low fat’ or ‘reduced salt’. 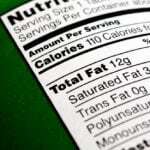 How can nutritional information be used? Nutritional information is generally used in food labelling to allow consumers to make informed decisions about the food they are buying and help people with specific dietary needs such as diabetes and heart disease. However, more and more retailers and caterers are opting to provide nutritional on their recipes, menus and websites. A nutrition matrix is one example: this is a table with your dishes down the side and the nutrients along the top. The data can be presented as amounts, percentages or as traffic light colours known as high/medium/low or HML for short. Who should provide nutritional information? Any business that provides packaged food for public sale is required to include nutritional information. Examples of this are: boxed cakes, ready meals, packed meats and poultry, processed foods such as pizzas, burgers and sausages (in packaging), and tinned or jarred foods. This entry was tagged food labelling, food legislation, nutritional labelling. Bookmark the permalink. ← Is Undercooked Meat Safe?